to continue to harvest this delicious amber gold. best anti-inflammatory attributes for skin too! you need to, it will complete you. favorite among the hippies and the hippies at heart. and need a light lotion. with you about our natural products. ​The best way to spread Christmas cheer is giving ModernRoots products, far and near! As Christmas is celebrated all around the world, the coziness of winter and the holidays in Minnesota is like nowhere else. Snow blankets the pine trees like a fine Victorian lace and beautiful Blue Jays and Northern Cardinals pop out against the white snow. We take refuge in our warm homes as winter is here. Carolers in the street, making snow men, and Christmas scents are some of my favorite things this time of year. Everyone has their favorites that makes them think of home, warmth and family. Some of the most important things to be grateful for this season. 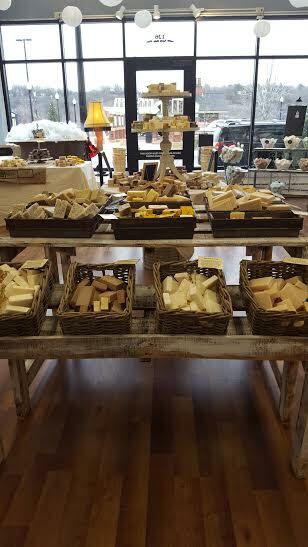 The store is packed full of Christmas goodies including our winter soaps. Come sniff out these favorites! T’was the Night Before Christmas: an earthy, woodsy, pine sweetness. Santa Baby: Gumdrops and pixy dust make this a unique soap that is a favorite every year. Frankincense & Myrrh: Healing oils and gentle goat’s milk combine with rich frankincense and myrrh essential oils all topped with ground resin. An amazing biblical gift to share. From all of us at ModernRoots, we wish you a very Merry Christmas! ModernRoots Wayzata Grand Opening! Friday, September 8th from 5-9pm!! Wayzata is close to opening! Permitting, design, product creation and build build build. We are excited to share this evening with the existing and new ModernRoots customers. We will be serving our delicious Chai Chaga tea and will have free product giveaways, a gift basket valued at $200 to draw for, makeup consultations and more! 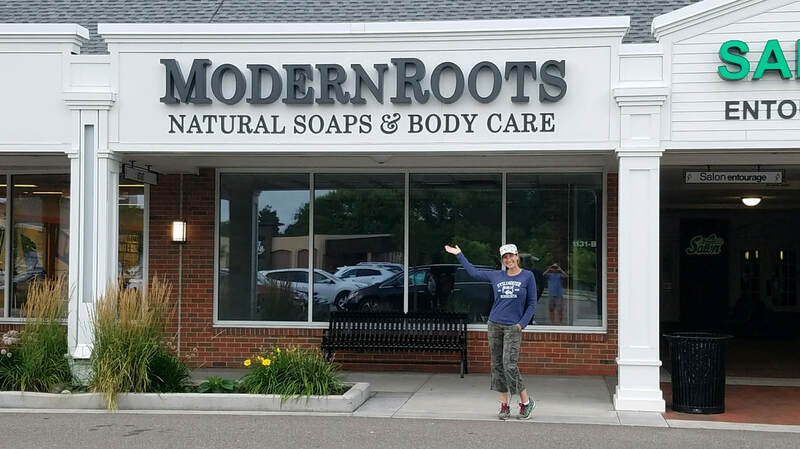 I am so excited to announce the COMING SOON of ModernRoots Wayzata! Located at 1131B Wayzata Blvd. Wayzata, MN (off of 101 and Wayzata Blvd). We have been working on this gem for six months now with an estimated opening date of early to mid August. Much of the time was spent in negotiations followed by design, permitting, and buildout. 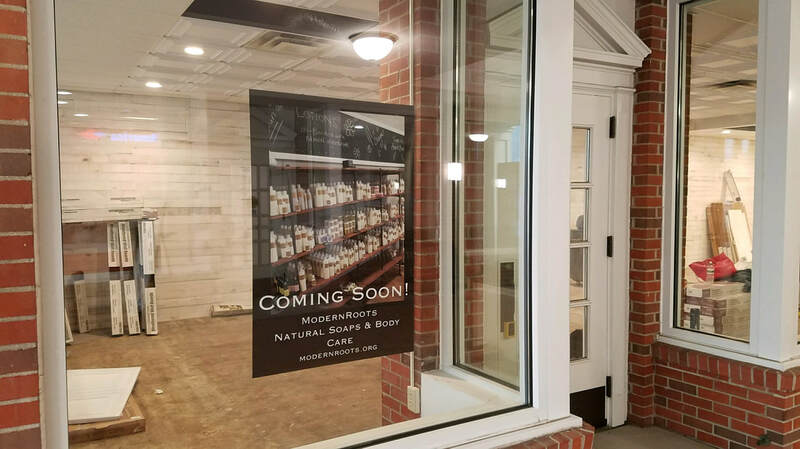 It is finally coming together and can't wait for those in and close to the cities to have a ModernRoots Natural Soaps & Body Care so close to home!! Stay tuned here and on Facebook as we unfold the buildout and development of this super cute space. As everything in my life, it is a work in progress. I have been designing and working on my garden to be darn near maintenance free for several years. When I was a teenager, my mother concreted her garden pathways with raised beds in order to keep the weed control down. 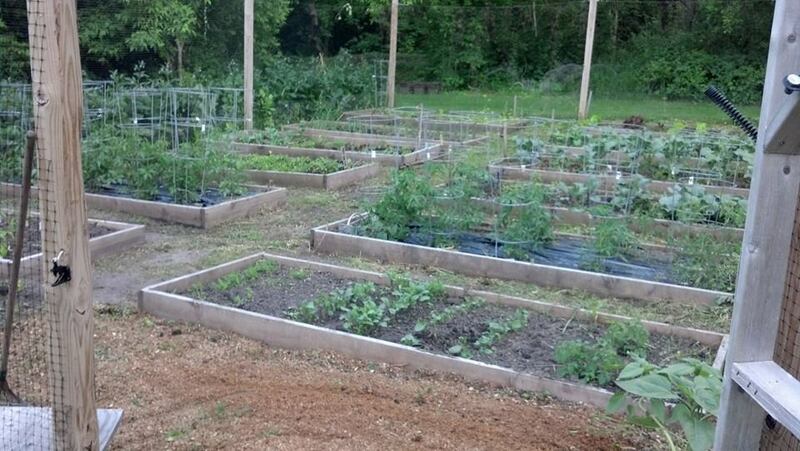 As I have been developing my own garden, I realize how brilliant this is. So much work to pour concrete, yes, but lots of work on the front end equals less work for long term, my motto I have adapted this year. ​I cannot tell you the times I am asked, how do you do it all. First, I don't feel like I do it all. I feel like life is a journey and my interests lead me. The farming and gardening I do is enjoyable. But then again, I do enjoy a bit of physical labor. 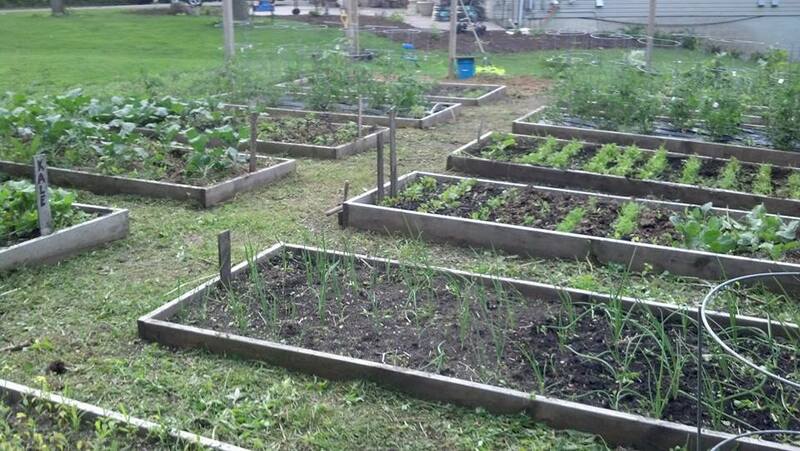 But in the meantime I am trying to set my farm and gardening up for ease of daily work. 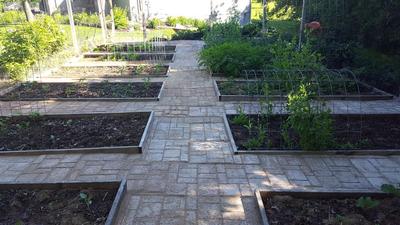 The garden for example, concrete pavering in between aisles allows my feet and shoes not to get so muddy and messy. 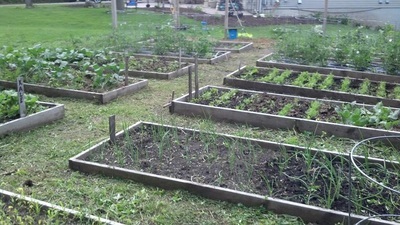 It also eliminates weeds between beds. Yep, eliminates. 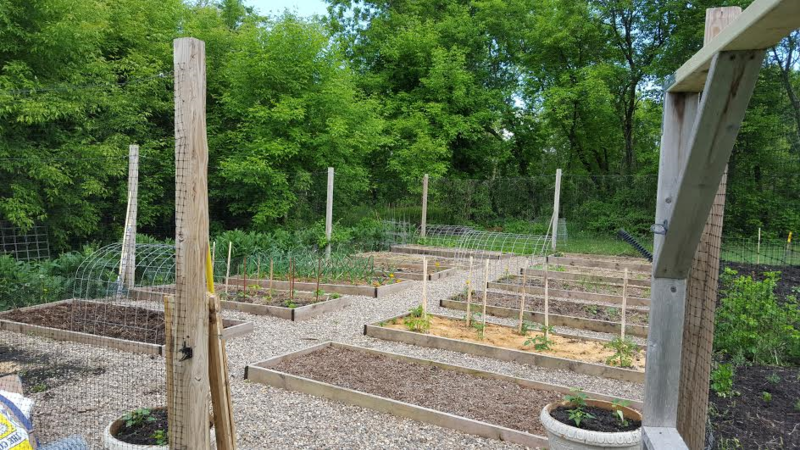 All the extra farm and gardening "work" enhancements, is to help my homestead to be time efficient, while also being very enjoyable. Therefore, the Potager Garden is perfect for me. Plus it is gorgeous. Double score. ​I am so glad I went with this philosophy. We made our garden about 20 feet from our house, 25ft X 45ft. 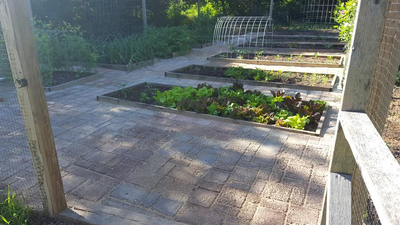 ​Phase Three was the following year which consisted of leveling the aisles, weeding of course and laying pebble rock about 1/-4inch to 1/2 inch in size. This makes a good base for laying concrete pavers. 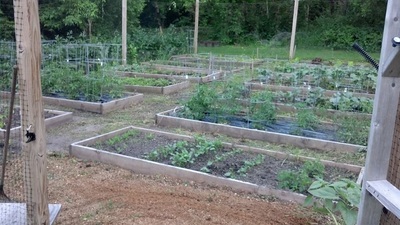 I planted the garden that year with full expectations of laying the concrete soon after, Phase Four. Life got busy and it wasn't until fall when I had a chance to start Phase Four, lay concrete pavers. 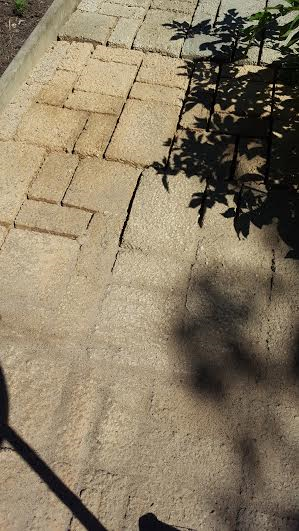 And by lay I mean, buy a form that looks like old world pavers, buy 80 lb bags of concrete hand lifted into a mixer, add some colorant and water, scoop concrete into the form and do it over and over and over and over.....again. This is strenuous hard work. ​Phase Four was nearly impossible to do by myself, trust me I tried. I did 8 bags by myself and was whipped. The overall amount of concrete was 185 - 80 lb bags. 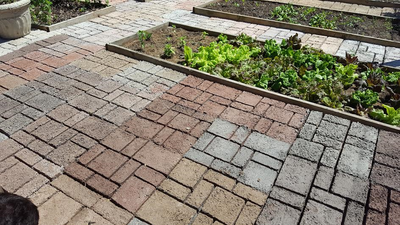 You will need a few people to help you accomplish this if your are going to paver a large area. I had my husband help with most of it and they other part my parents helped me. I am so thankful for the help! ​After pavering, I needed to fill the cracks with sand, Phase Five. I really didn't think this needed a "Phase" number but after sweeping 30 bags of heavy sand into cracks, I decided it most certainly needed a phase number! It took me 12 hours constant (with a lunch break and store run to get more bags) to finish it. 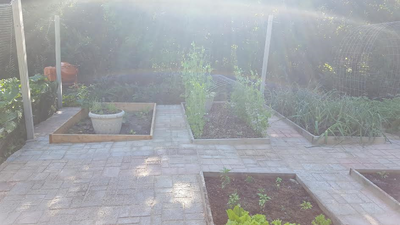 I learned from my mother that not just any old sand will not do, I needed to get the no weed sand that sets up gently with water so the weeds don't grow through. 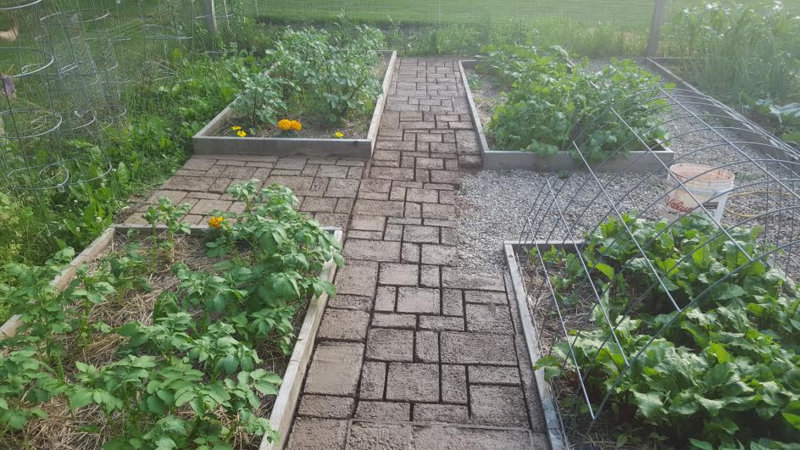 When my mom made her garden, There wasn't a sand that set up like we have today so she continually gets weeds through the cracks of her pavers. I will chose to learn from her in this case. After sweeping all the sand into the cracks and off the pavers, I sprayed all of it with water two separate times, morning and evening to 'set' the sand. Done! Now I can enjoy weed free aisles and the beauty of old-world charm. 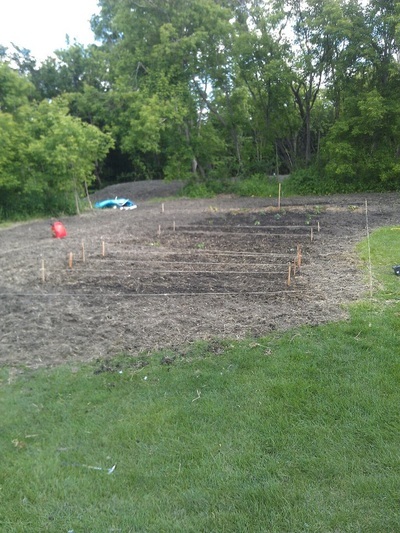 When we bought our place, it had nothing set up to farm. No chicken house, no barns, just woods and lots of grass. We have built everything thus far ourselves. I have taught myself everything I know from old world farming books, experts in organic (and beyond) agriculture and by lots of mistakes. But I can confidently say, this is the life for me. 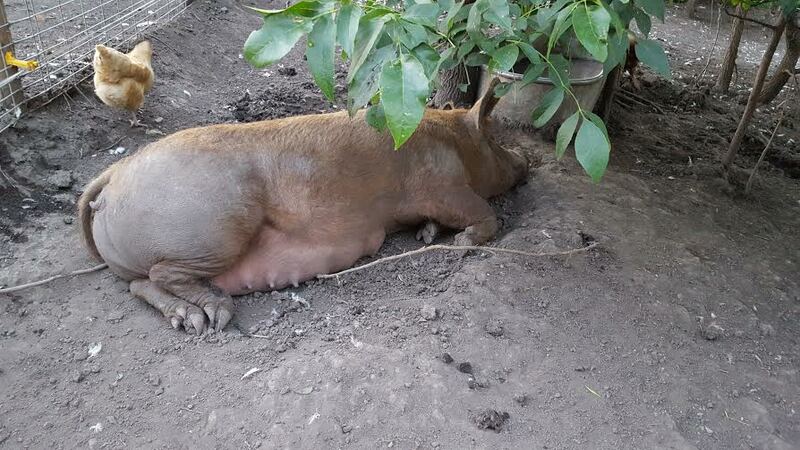 I do with very little to enhance my natural farming. I let the heritage breeds I have live with nature and allowing them to make their own wallows in the summers and straw beds in the winter. Heritage animals are very intelligent. You just have to give them the room and insulation in order to be so. In the summer, I grow an extra garden plot for my animals so they too have healthy greens. I naturally raise most of my animals in the open and in huts, shielded from the elements. They have all thrived even in the harshest of winters. 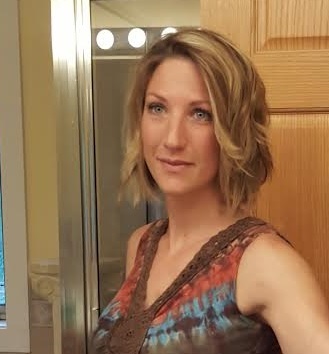 While I love being in the open and won't change much about that, it would be so beneficial for my artificial insemination and other future farming exploration, to have an indoor place that I can bring the animals for A.I.ing, if they are hurt and need repair, or better shelter for my goats. I also have been dreaming of a place to store my farming and essential oil extracting equipment. I am sensing, and by sensing, I mean been told several times, my stuff is 'outstaying' it's welcome in Mr. Hunky's shop. 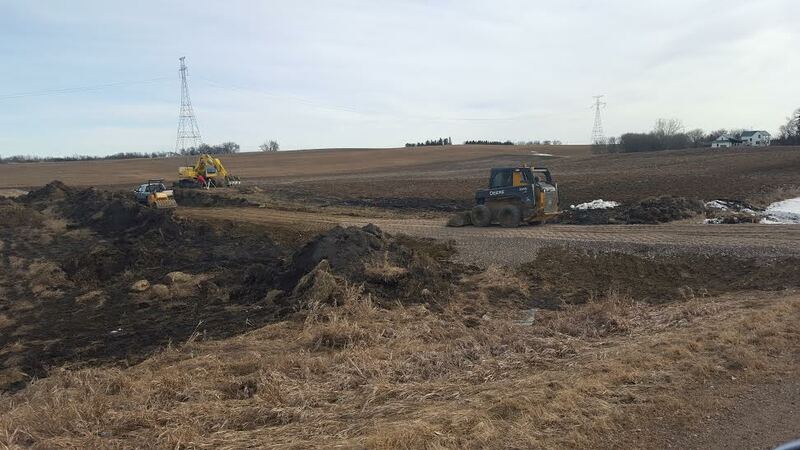 Therefore, this year, after adding the 5 prime tillable acres this past fall, we are building a barn. 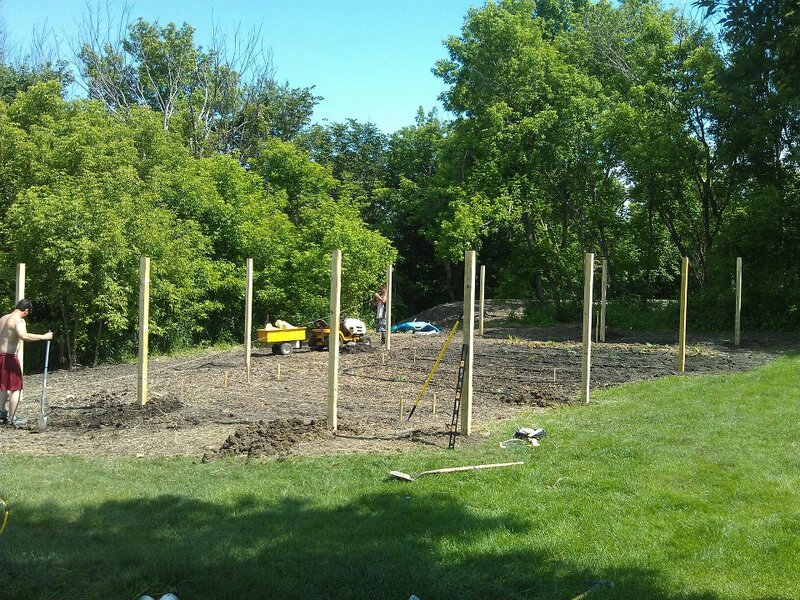 Let me say that again... WE ARE BUILDING A BARN! One that has a milking room, farrowing stalls for in the winter, and to have a cozy place for my goats and other farm chaos. I can confidently say we are building a barn for my animals. I have a major problem with thinking about things for LOOONG periods of time before making decisions. Processing really. It's all about processing and the time it takes me to do so. But I am now comfortable saying, we are in the process of building a barn! I am writing and designing plans that I can pasture rotate groups of similar animals bi-weekly on the acreage around the barn. I want to show how to develop land to it's fullest like it was done hundreds of years ago. 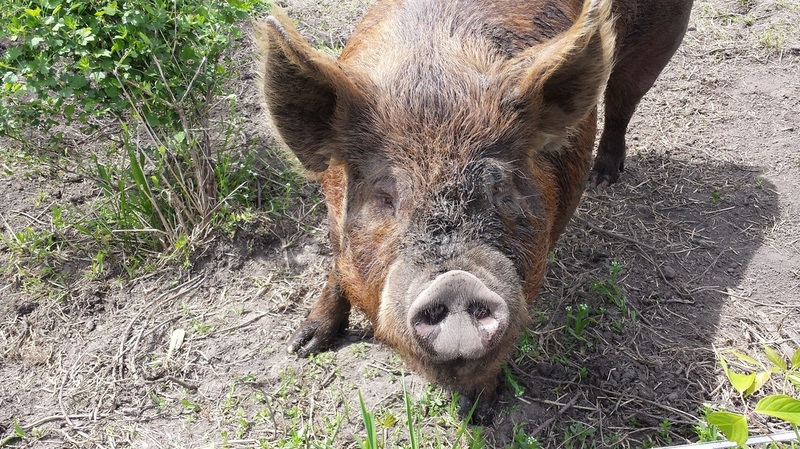 I can't tell you how amazing it is for me to see my expanding farm dreams grow and I encourage anyone contemplating starting their own purposeful natural farm over and over again. It is hard, wonderful work. In order to build the barn, it needs a driveway to access it. I needed to get a permit to put in a separate driveway since the acreage would be very difficult to access from our current driveway. Well, Try to explain that to the county. This was NO easy feat. In fact, this entire process has been tiresome and at times I see myself throwing my hands up. But no, I find the energy to push on. The saying "where there's a will there's a way," is so true for me. In a nutshell in 1980 my county passed a 'general' rule that all accesses were 1 per 80 acres unless the acreage bought was in someone else's name. All the accesses thus far that were put in previous to this were grandfathered in. But apparently because the acreage we bought is in my husband and I's name, the same as our house, that doesn't count. BUT if I put it in Joe Schmoe's name, I could have a driveway. I promptly told them this was ridiculous. Then they expressed to me that on Google Earth (oh Google, google knows all) it showed that I could technically access the acreage by driving through our shop and around the back side of our house down the field onto the new part. Ahem, yea, really accessible. Again, I pointed out how ridiculous this was. Then they wanted me to ask my neighbor (the guy I bothered for 3 years to sell me 5 acres, awkward) if I could have HIS access. meaning taking his access out (yea he farms) and move it to my land. His access is about 2000 feet down the road. On what planet does this make sense?! Regardless, because I just KNEW anyone in their right mind isn't going to get rid of one of their grandfathered accesses, I asked him anyway. He laughed. I laughed. And I asked him to let the county know what he thought of that. He did. So, after going round and round with them about having an access for that property, they finally granted it to me. And I am so thankful. As a side note, I do understand, for road safety, you can not have roadways and accesses where ever you want. After the driveway gets put in the barn can get started. who knew there was so much to building a driveway! Culverts, clay, gravel, compacting, road restrictions. Uff duh. But soon it should be done and the beginning phase of my barn building can begin. This picture is the driveway getting started.... not much to see but now that you know the details of how difficult it was to proceed, it is a beautiful site. More to come on the barn building! Hiring Part-Time Help in Stillwater! Excited to announce that ModernRoots Stillwater is looking for part time employment! ** I have hired all part time people currently needed. Classes are Tuesdays and start at 630pm and end at 8pm. *ModernRoots store open to attendees. Come to store to sign up for classes 205 5th St NE Buffalo, MN Suite #4- or call store during store hours.